From August 2015, the Houses of Parliament adds Brazilian Portuguese as a language option for the popular self-guided audio tours through the House of Commons, House of Lords and medieval Westminster Hall. This complements the existing audio commentaries in French, German, Italian, Spanish, Russian and Mandarin, as well as English for adults, English for families with children and a screen-based version in British Sign Language. 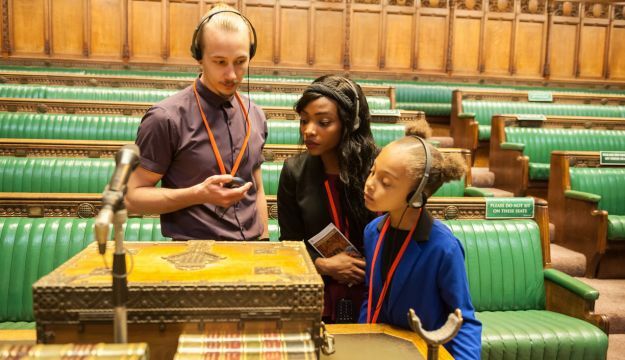 The audio tours, and the award-winning ‘Blue Badge’ guided tours, are available on Saturdays throughout the year and on most weekdays during Parliamentary recesses including Easter, Summer and Christmas. Tickets can now be booked for tours running Monday to Saturday between 3 and 29 August 2015. 2015 is a special year to visit the Houses of Parliament with two significant anniversaries being commemorated on the theme of ‘Parliament in the Making’; 800 years since the sealing of Magna Carta (1215) and 750 years since Simon de Montfort’s first parliament (1265). Until late November, tour tickets include the colourful large banner exhibition ‘The Beginnings of that Freedome’ in Westminster Hall that charts an 800 year history of rights and representation. Many parts of the Houses of Parliament tour route have featured in the BBC’s recent ‘Taking Liberties’ season of programmes including ‘Inside the Commons’ and ‘Suffragettes Forever! The Story of Women and Power’. This has led to even more interest from visitors wishing to follow in the footsteps of the Queen’s procession at the State Opening of Parliament, and to see for themselves the magnificent gilded throne and canopy in the Lords Chamber and the famous green benches in the Commons Chamber. Stylish Afternoon Tea in the Terrace Pavilion can be added to selected tours, Tuesday to Saturday throughout August 2015. A tempting seasonal menu that combines tradition with a modern twist is served in this spectacular Thames-side location.